Ok, so i know it hasn’t technically been that long since i got back from Nassau’s sun-filled shores but England was grey and chilly and i was getting withrawl symptoms from the warmth, So when mum proposed a little trip to spain i jumped on it and soon enough i was filled with dreams of sun, sea and sangria. We had a little gander at flights and before we knew it, we were up at the crack of dawn and Marbella bound. After a couple of days relaxing by the pool and having dinner at home, we decided to venture out to our favourite little tapas bar, La Taberna del Pintxo. Tucked up a little back street, slightly away from the busy, tourist-filled front line it’s the most charming little place. The outside tables are big old barrels surrounded by high stools and are a great place to sit and watch the world go by although i must say, sometimes it gets a little ovewhelming with people bustling past all the time. It gets busy though, don’t be surprised if you sometimes have to wait for a table. I always think this is a good thing however, there’s nothing worse than an empty restaurant in terms of atmosphere and no one flocks to a bad place so i think it’s always a good sign. 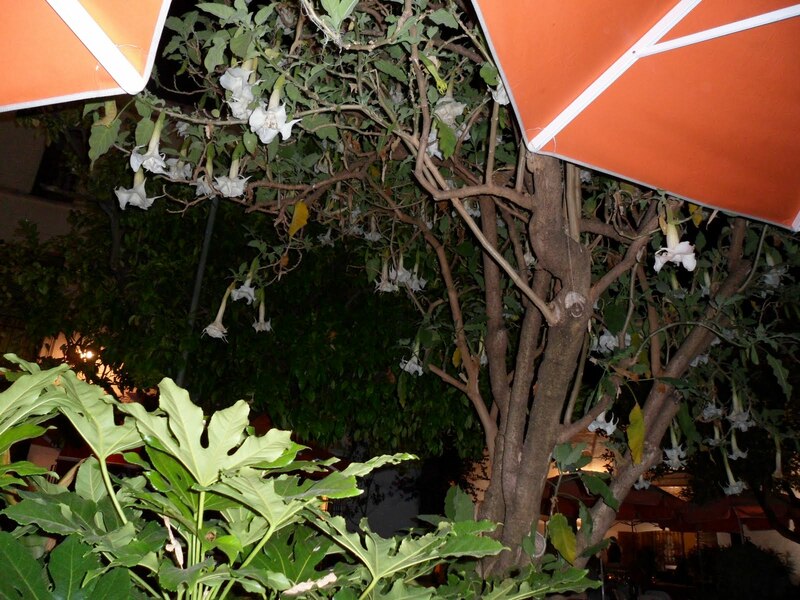 This is maybe not the right place to go if you’re a picky eater, the whole premise of this place is that you just sit and relax with a drink and the friendly staff bring around plates of tapas. On the whole the staff speak some english although there is definitely some guesswork involved a lot of the time, but my advice would be to trust them, it’s almost unheard of for something to come out of their kitchen that is not utterly divine. Indeed, it’s the place i most look forward to going to every time i’m in Spain. 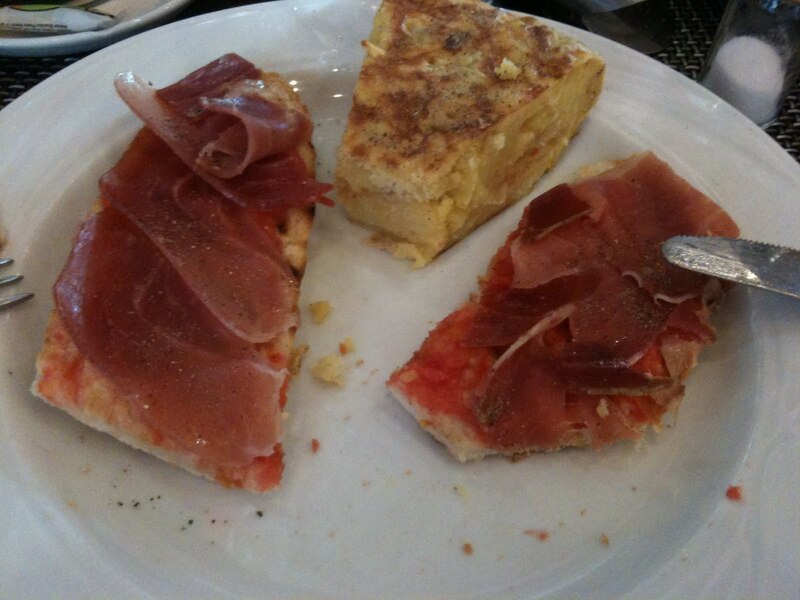 One of the first tapa to come around was the old favourite, tortilla. Basically it’s just onion, potato and egg but somehow the spanish manage to make it utterly delicious, i think vast quantites of scrummy local oil probably have a lot to do with it. 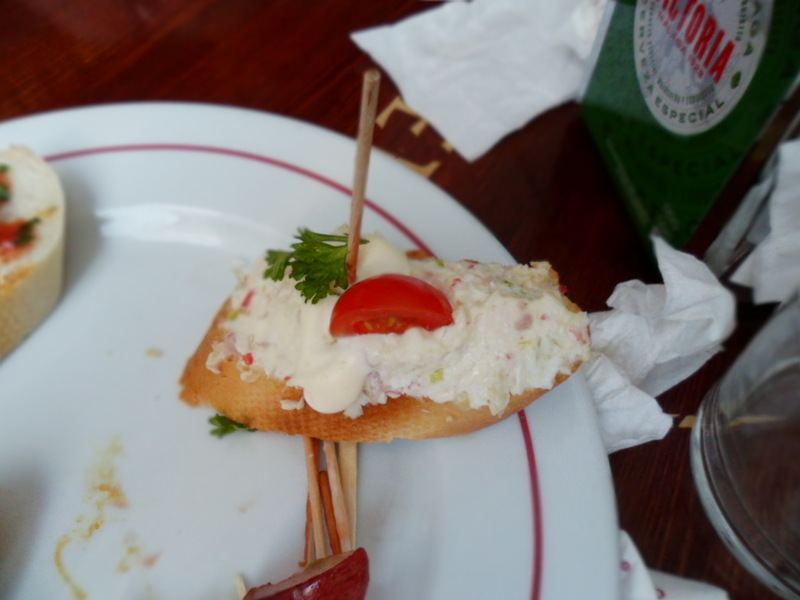 Next up, came something involving crab, we’re not entirely sure what it was but apparently it was very good. There was also a delicious ham, cheese and oregano toast, to be honest i’m sold on pretty much anything with oregano but this was really moorish and surprisingly fresh tasting. 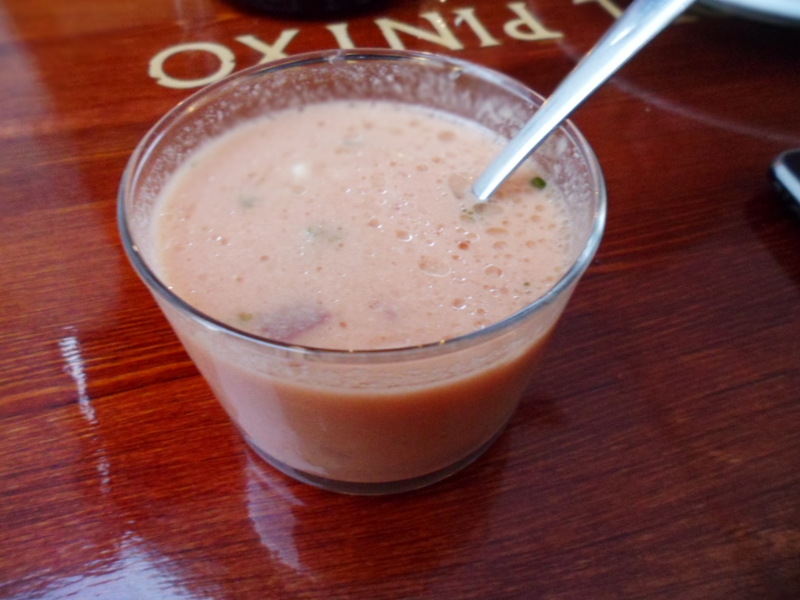 A seriously good little glass of gazpacho which is something i drink by the gallon anyway when i’m in Spain as it’s just so refreshing. This one was made even more special by the addition of little chunks of serrano ham and manchego. 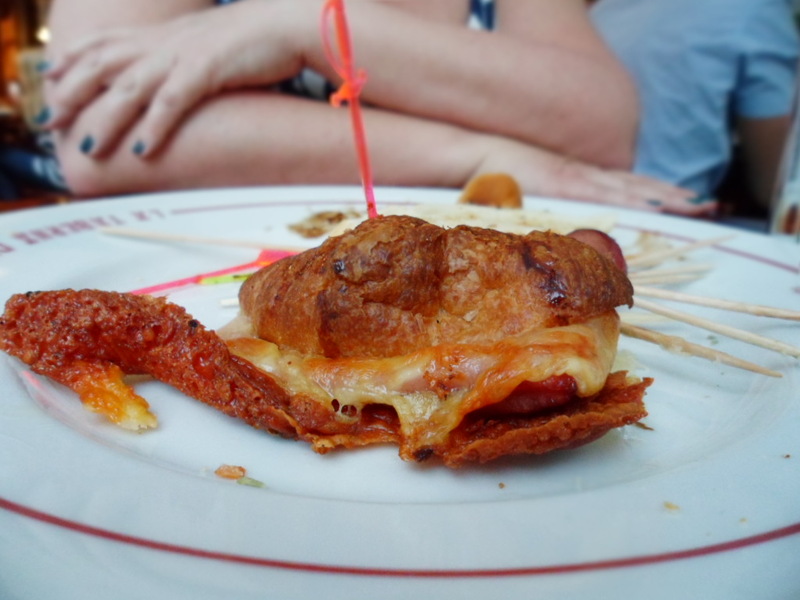 A scrummy little croissant filled with cheese and something which i can no longer remember, i just remember that it was good and i wanted more but they’d run out! Then there was the cutest little mini lasagna. Now i have to say, this is obviously not the most traditional tapa and i admit it wasn’t my facourite but i love the idea of it, i’m thinking it’s something i want to do myself so watch this space. 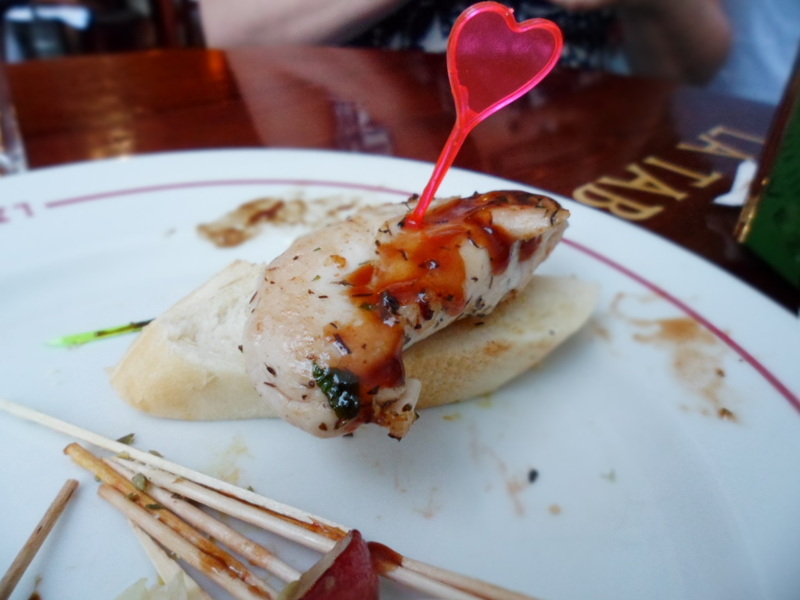 There were plenty of other tempting little morsels to be had as well but i forgot to take photos of them all. 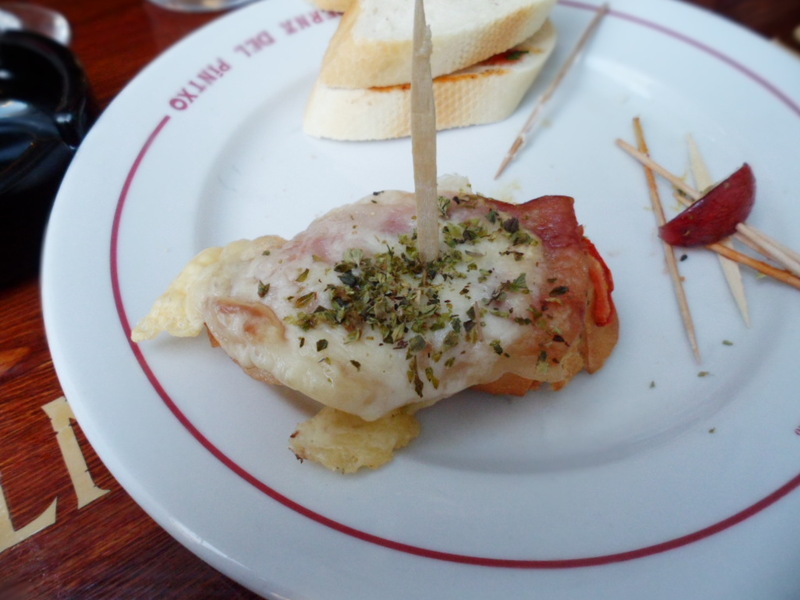 One of my favourites was the croquettes de jamon, creamy and fluffy and hammy. yum. 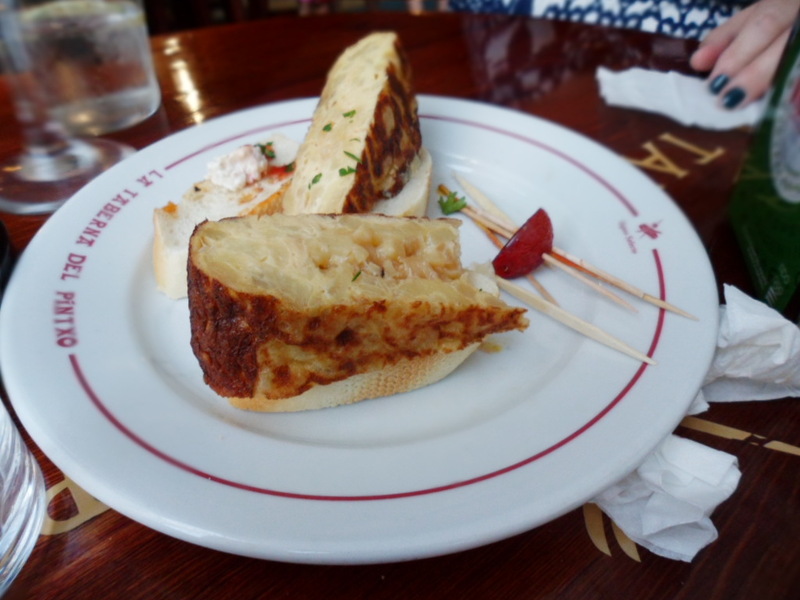 Bite-sized hamburgers, quesadillas and tarts topped with quails eggs were also floating around and whilst i didn’t have any, they also do little puddings including a mini flan had by mum which definitely made me pretty jealous. This is a great little place to go and relax of an evening, sit with a glass of wine and chill. The other great thing is that you can take as little or as long a time as you want, you can luxuriate for hours or be in and out within 15 minutes, eat what you like and then at the end of it all, the waiters simply count up your sticks and hand you the bill, which is usually lower than you’d expect for the amount of food you inevitably eat there. A few days later we popped up to la canada, a shopping centre up the road and, after doing a little shopping for the boyfriend i decided i was in fact pretty starving and wanting some breakfast/brunch/lunch. There wasn’t a great selection of restaurants so i picked a little cafe and thought i’d make do. And was really pleasantly surprised. Usually any place that has pictures on the menu scares me a little but this may just be the exception that proves the rule. They had loads of pastries and ice creams as well as salads and pizzas, but that wasn’t what caught my eye. One page of the menu had what was simply called Spanish brunches. 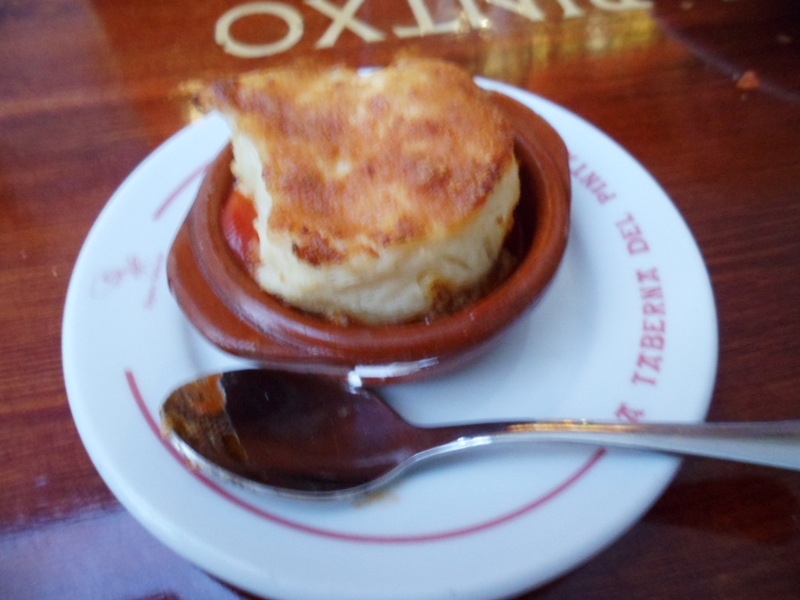 The first one was what caught my eye, a relatively simple combination of bread smeared with tomato and topped with serrano ham served with tortilla. It really exceeded my expectations, the kind of thing that would really only be good in spain as the ingredients were all so fresh and full of flavour. Definitely something i’ll be bearing in mind for future lunches. As you’ve probably noticed by now, i have a bit of a thing for breakfasts, brunches and the like and this next one was no exception. It’s not somewhere i’ve ever been before, a sweet little place called Pasion Cafe in San Pedro but my friend Sophie used to work there and as i was having breakfast with her, she suggested we check it out. I slightly tweaked what was on the menu to make it more me and was glad i did, it made the whole thing a lot lighter and fresher than it would otherwise have been. 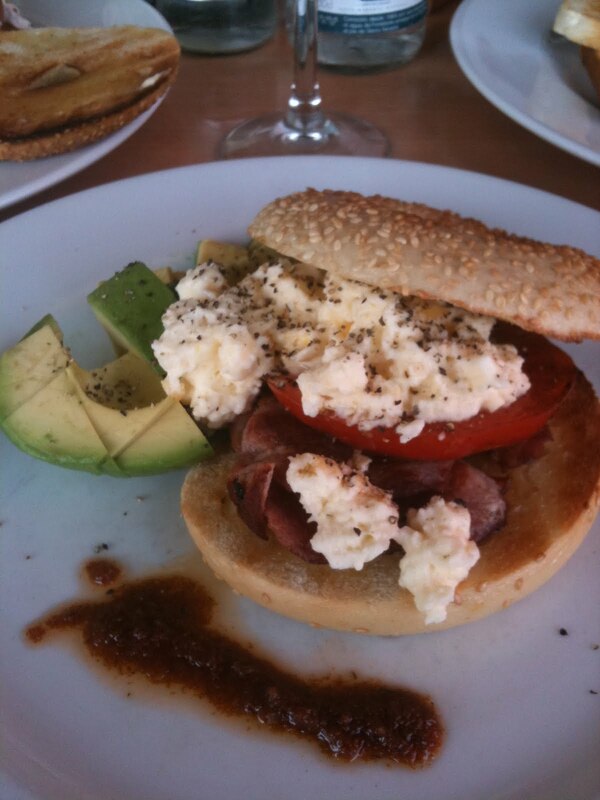 Scrambly egg with grilled bacon and tomato and some avocado on a seedy bagel. It was supposed to have cheese instead of avocado and poached egg instead of scrambled but i liked it this way, it made me feel a little less guilty as well which is always a good thing. We had some other really good meals whilst we were there, including a very memorable paella in a flower filled square in Marbella which lasted about 3 hours but was such a gorgeous setting that it was worth every minute. And a scrummy pepperoni and red onion pizza at the ever popular Picasso’s in the harbour in Puerto Banus. You always have to queue down the pavement as there’s a no booking policy but it’s worth it once you’re in there with the pizza that always arrives hot and fast and the friendly efficient staff. If you have room try the brownie sundae which will make you feel guilty as hell but i think you’ll find it’s worth it. For a more virtuous approach, the melon is really good, perfectly ripe and served with juicy strawberries, the perfect finish to a fairly unvirtuous meal.